Roy Russell from Fetcham was an integral part of the secret radio network known as the Special Duties Branch, set up by Winston Churchill in 1940 and a part of the Auxiliary Units. Roy started off as an ordinary infantryman and it was only when questioned by his enlisting officer that his career became clear. After joining the Corps he trained in Morse code and went on to intercept coded messages from German planes during the Blitz. 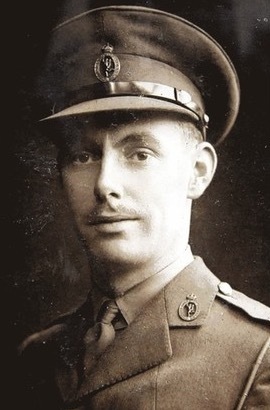 He later did officer training and was given his own area of the secret communications network covering parts of the North Sea and Channel coasts in the South East. The centre, near a cinema in Sevenoaks, was highly secretive and concealed in case of enemy invasion. Mr Russell said: “It was hidden in a copse and to get in you had to find a little squar-ish stone with a cross on it which hid a square top of a metal rod. I would use a crank handle to raise a manhole-like circle covered in grass off of the ground, and step down a ladder. You can see a similar location in Norwich here. Roy’s secrecy over his wartime experiences lasted for 50 years after the war and he only told his story after receiving a phone call from Aux Writer John Warwicker. More than 60 years after the war ended, Mr Russell finally received recognition for the vital part he played in the Allied victory. 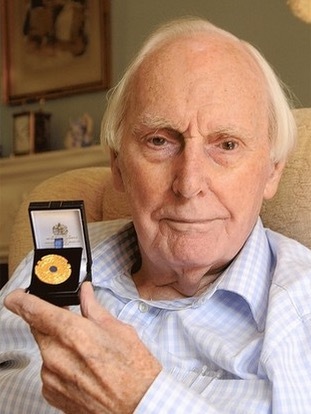 Because of the confidential nature of his work Mr Russell received no recognition for his efforts until he received a letter and medal from then Prime Minister Gordon Brown in 2009. In the post-war years, Mr Russell became a successful screenwriter for much-loved TV series including The Saint, Dixon Of Dock Green, Tales Of The Unexpected and The Onedin Line. He also wrote several documentaries, including one on Prince Charles called Pilot Royal, and another on Sir Francis Chichester’s epic voyage around the world, called The Lonely Sea And The Sky. Throughout his career he was an active member of the Writers Guild of Great Britain and was awarded their Laurel Award for his services to the Guild. Roy died on January 8 2015 after a five-year battle with Alzheimer’s. Sources: Surrey Mirror, Dorking Advertiser, BRA Archive. Roy Russell was our landlord for 3 1/2 years when we lived in England. Not only did he help us adjust to the English way of life, he and his wife Barb remained friends for all these years. Roy Russell was a my uncle. His wife Barbara was my mother’s sister. I have very fond memories of him.